A Temporary Neighbourhood Company was established in a Dessau-Roßlau neighbourhood, the quarter ‘Am Leipziger Tor’. The quarter ‘Am Leipziger Tor” is an inner-city neighbourhood built up with a mix of pre-fabricated, 1930s and Wilhelminian period housing. Many local residents have left since 1990. The quarter, in contrast to other Dessau neighbourhood is suffering from extreme population loss, out-migration, unemployment and unoccupied housing rate. Three schools have been closed since 2000. A campaign to counteract this adverse development was initiated under the umbrella of the Urban Development Support Program ‘Urban Redevelopment East’. Surplus residential properties are subjected to ‘planned’ demolition in order to make way for new qualities. Cleared land plots are redeveloped into an inner-city landscape range. Now, locals enjoying a green view rather than empty windows, abandoned streets and derelict premises – n the middle of the city! The Mykorrhiza project is not restricted to structural schemes to help stabilise the quarter but also includes activities to foster its interior strength by providing support and assistance to residents and their social networks and making offers for active neighbourhood work. Together with young people, a temporary neighbourhood company was established and thus also a novel learning venue created. Young people have contacts with local entrepreneurs and get to know vocational fields that are oriented on the needs of the quarter but also familiarise them with new and future-proof vocations and professions. They experience in an almost playful manner what it means to perform a job by evaluating different scenarios of day-to-day corporate activities. Urban gardening is the practice of cultivating fruit and vegetables in a city by using open spaces and urban wastelands. The objective is local food production and consumption in order to avoid long transport distances and hence pollutants (such as carbon dioxide). Such foods shall be cultivated according to ecological principles so as to avoid their contamination with harmful substances, use of artificial fertilizers as well as water and soil contamination. Further key factors are self-sufficiency, independence and strengthening of local markets. Supply of city-dwellers with locally grown horticultural produce is supplemented by further effects; inter alia improvement of urban microclimates or preservation of biodiversity. It goes without saying that such a scheme has also a social component. Joint gardening activities facilitate contacts and encounters. Clearing of garbage and replanting of urban wastelands create practical learning environments with potentials of sensitisation for sustainable lifestyles and biological cycles and acquisition of relevant knowledge. The company division ‘Urban Gardening’ imparts to young people basic knowledge in gardening, horticulture and nature (e.g. plant, soil, weather, equipment and tools) as well as practical gardening and crafts skills. Participants learn something about classical garden design concepts and aesthetic rules of abstraction and composition. The whole exercise is focused on practical projects: building of a raised bed, wasteland reclamation, recycling garden… depending on the potentials of a given site. Gardening-related activities are complemented by artistic tasks to promote envisioning and observation capacities as well as perceptiveness in young people and strengthen their creativity. The project module Creative Industry is a field of work where the young participants learn how to describe, present and ‘market’ a product or project. They gain insights into different tasks and responsibilities during public presentation, communication and PR work of a company. The approach does not only focus on an additive synopsis of single marketing activities but involves a deliberate coherence of selected media and desired effects. The Temporary Neighbourhood Company adopts two key pillars of creative design: media-related and artistic/practical elements. The media-related component of the module uses digital technology to document workflows in a given project which are then creatively processed in different formats in a second step. This component is contrasted against the artistic part of the module where work does not rely on digital equipment to emphasise that also creative design with simple means can draw public attention. The interaction of the two components ensures that the M! Project is omnipresent in the local quarter and even worldwide through digital media. Subjects like self-employment and entrepreneurship are often neglected in school education. Hence, it is difficult for many young people to imagine how a typical entrepreneur goes about doing business or they may have wrong ideas. This is where the project module Basics/Social Competences starts. The Temporary Neighbourhood Company is used a hands-on platform to impart basic business knowledge and terminologies of entrepreneurial activities. During practical work and meetings and discussions with local businessmen the young participants gain first-hand insights into the motivations of different managing directors and their staff members and learn how they approach procurement of various qualifications in individual corporate divisions – production, sales, marketing, company organization, time scheduling, costing, task planning, HR planning, etc. Team building and team concepts but also self-care and self-management are a second priority in this module. A variety of exercise is performed to illustrate processes and workflows in corporate organisation and internal communication. The desired outcome is that the participants develop an understanding of the advantages of clear-cut structures, procedures and arrangements. At the same time they can discover (e.g. in role plays) their special skills and aptitudes which may help them in choosing their upcoming career entry. The project idea was based on a concept for the urban quarter ‘Am Leipziger Tor’ commissioned by Dessau Municipality in 2006. This concept stipulated a consistent orientation of all relevant instruments and actions to social space as priority field of action for stabilising this quarter. This approach entails a re-orientation of work by social assistance organisations and stakeholders: A substitution of a purely client-oriented approach by work with a stronger impact onto the quarter, the urban space. The network of social assistance organisations is qualified to act as executing agency for projects to advance economic activities in the quarter, anti-dilapidation strategies and new education projects. The idea of a quarter-specific budget is introduced into the public and local politics discussion as a basis to safeguard continuity in neighbourhood work otherwise rather characterised/determined by project financial assistance. 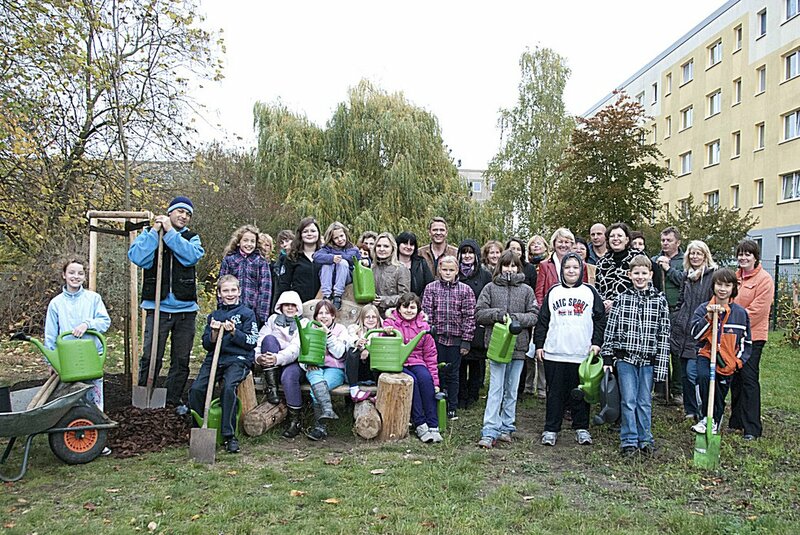 Upon a suggestion by Dessau Municipality, the project concept ‘Mykorrhiza’ was filed for support under the Federal ESF Program ‘Social City – Education, Economy, Work in the Neighbourhood’ (BIWAQ) 2008. ‘Mykorrhiza’ was among 93 projects that were selected in a first round from out of 500 expressions of interest in a two-phase application process. The BIWAQ Program ‘Education, Economy, Work in the Neighbourhood’ is accompanying the support program ‘Social City’. It takes up the challenge that present-day urban development does not only have to cope with structural but increasingly also socio-spatial issues and problems. The program is an endeavour to work against social segregation of urban districts by supporting projects aimed at stabilising quarters through education/training, local economy and creation of opportunities/cohesion forces allowing young people to stay. The project is aimed at offering opportunities to young people in their vocational orientation phase, but also pupils and young adults, in ‘taster courses’ and ‘temporary companies’ to familiarise themselves with new fields of work as well as local businesses with their products and qualifications and thus help them to develop personal prospects in the quarter and the city of Dessau-Roßlau. In return, the quarter will become more interesting and increase its stability through a large variety of activities and cooperation schemes and novel educational opportunities.